Beerchaser Miscellany – What’s up in Bars, Breweries, Etc.? 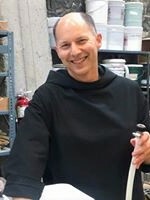 After over five years of planning and months of construction, the monks at the Benedictine Brewery are close to fulfilling the vision at the Mount Angel Abbey. I’ve worked as a volunteer on this wonderful project for the last two years. 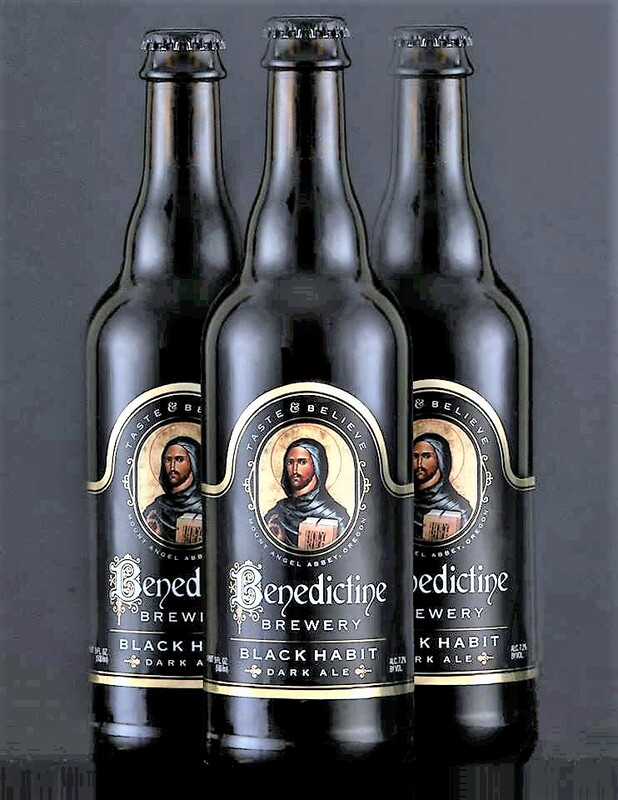 It will be one of only two breweries west of the Mississippi in which the monks are the owners and operators – the other being that located near Albuquerque, at the Christ in the Desert Benedictine Monastery. Father Martin Grassel, will be the General Manager and Fr. Jacob Stronach, the Head Brewer. The Grand Opening of the St. Michael Taproom will occur on September 22nd, shortly after the Mt. Angel Oktoberfest and you should plan to visit and raise a mug of their flagship beer – Black Habit. Or if you are not a fan of dark beer, try the superb Benedictine Farmhouse Pale Ale. Fr. Martin was Beerchaser-of-the-Quarter in July, 2017. 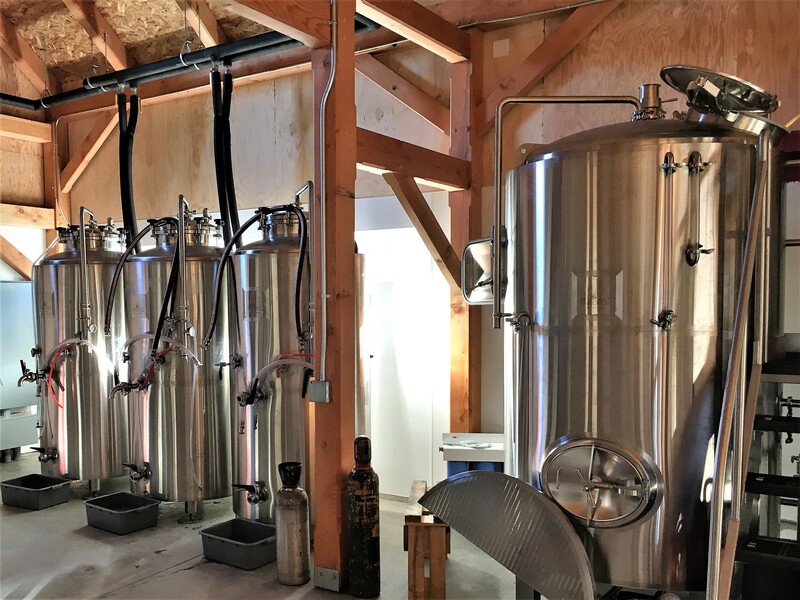 Benedictine Brewery hardware ready to go…. The Dynamic World of Bars and Breweries. The world of bars and breweries is ever changing. 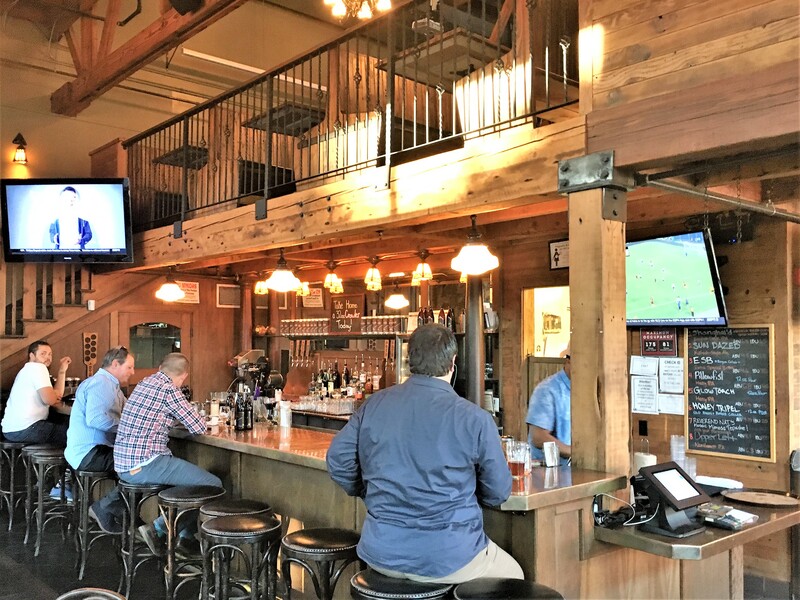 Fortunately, when we hear about bars closing, one will concurrently learn about new establishments – usually breweries, opening either in the former location as was the case with former Oregon Duck football star Joey Harrington’s Pearl Tavern (see below). 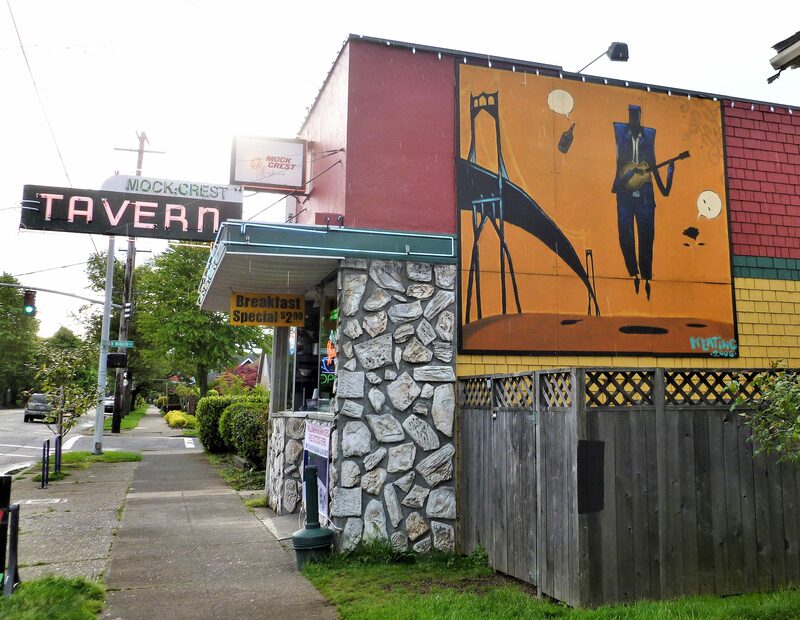 Successful enterpreneurs, Steve and Tom Waters, the owners and operators of the Backwoods Brewery and Taproom in Carson, Washington since 2012, will launch their new Pearl District pub in the vacated quarters at NW Everett and 11th. The Waters are both University of Portland grads and great people. Check out the new operation. 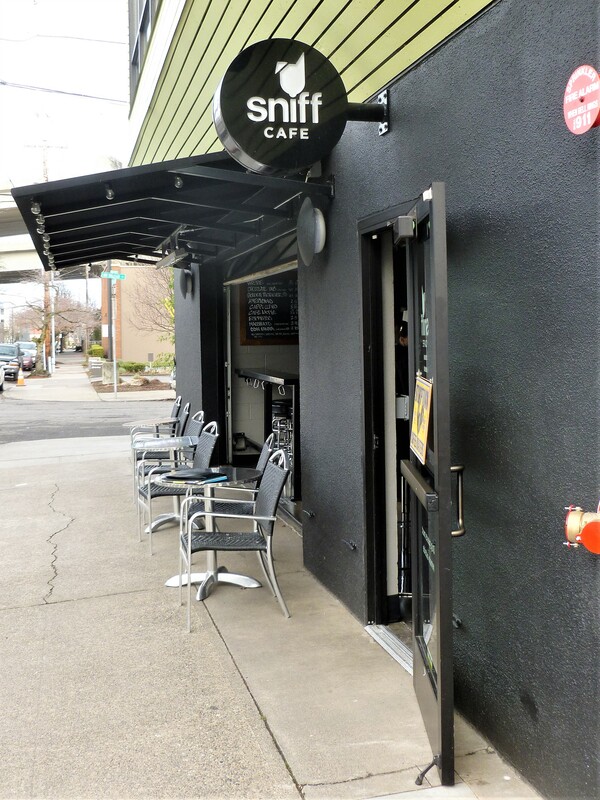 Other closures in the last eighteen months or so include the Lompoc Hedge House, BTU Brasserie, the Commons and the historic Copper Penny in Lents – now a high rise surrounded by new development. 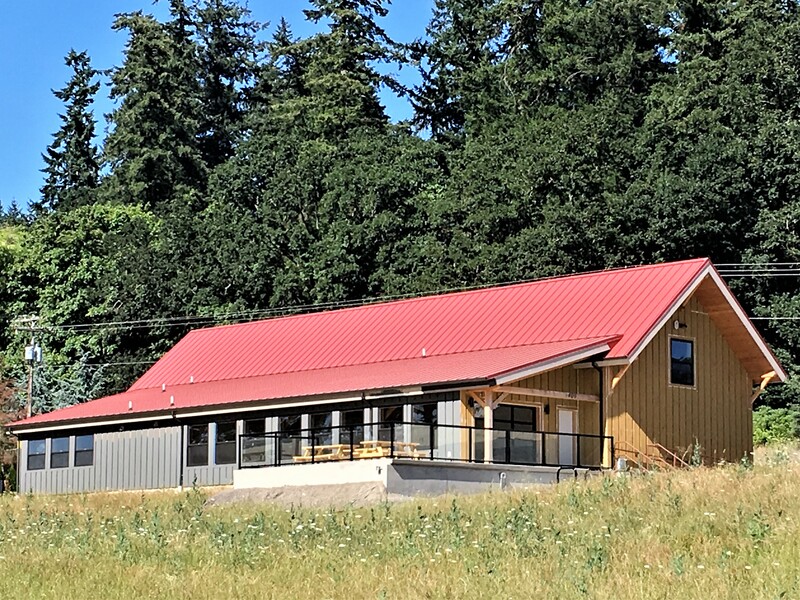 But new locations of existing breweries such as Sasquatch, Migration, Storm Breaker, Baerlic and Great Notion ensure that Portlanders will never lack for great locations to drink good beer. 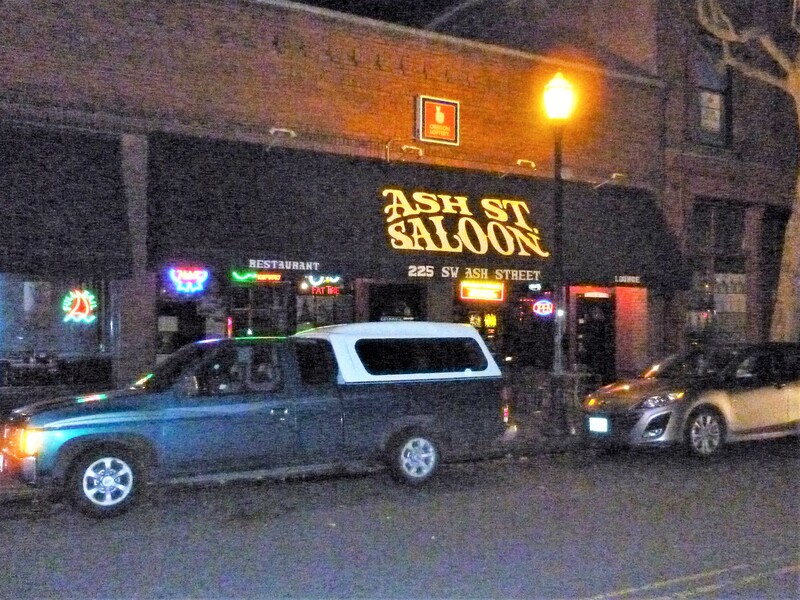 And while I am not generally a fan of retail establishments such as sports shop and especially Starbucks, ill-fated effort to substitute for the traditional neighborhood watering hole, I think two Portland establishments with this model deserve a visit. 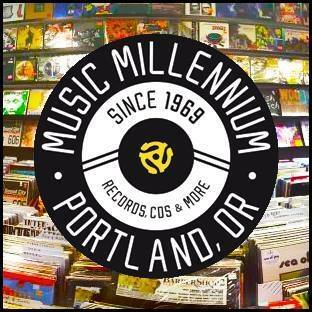 One is Portland icon, Music Millennium – the oldest record store in the Pacific NW, operating since 1969 and after having some challenges with the Oregon Liquor Control Commission, added beer and wine in 2015 to its amazing collection of recordings sold in all formats in their Burnside store. 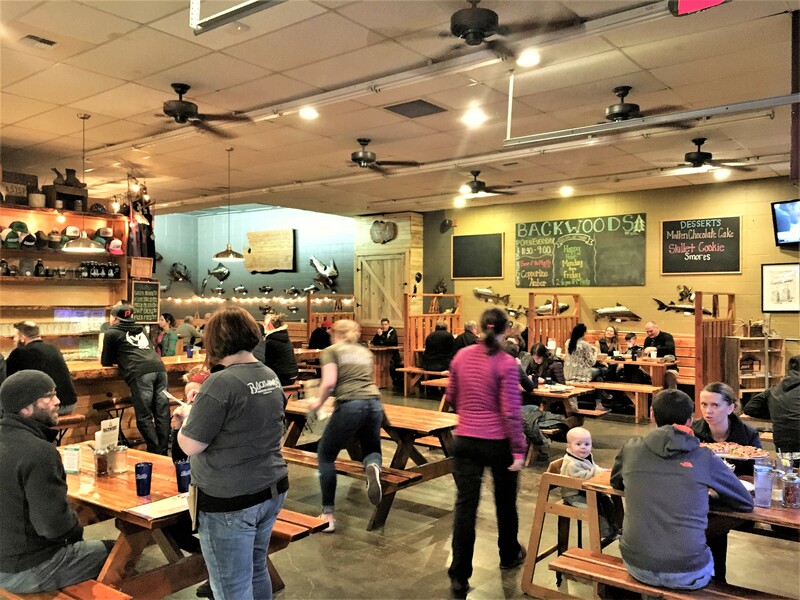 And after a quick call, I was pleased to talk to an amiable chap on a Sunday evening, who told me that they currently had three beers on tap – all of them excellent from three outstanding Oregon breweries – Barley Brown’s, Boneyard and Pfriem. 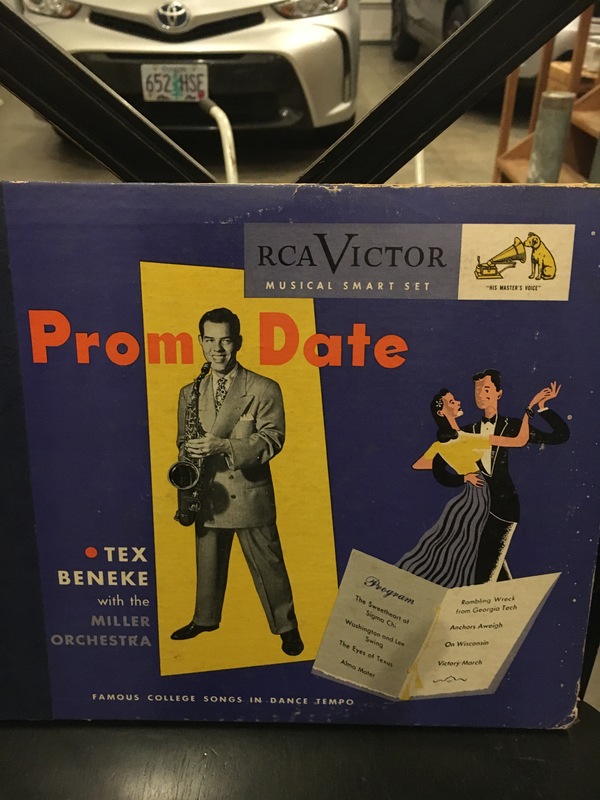 So if you want to pick up (or sell) an historic or fabled music item such as the two in my collection of ’78’s and ’33 RPM albums (see pictures) check them out and have a micro-brew while you’re there. 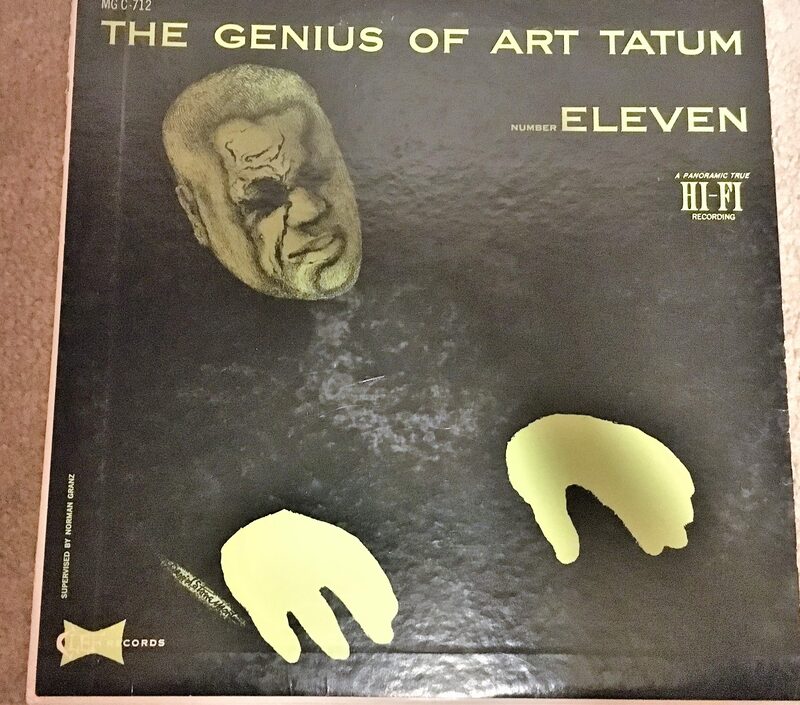 The second retail establishment that looks interesting is also music-related – Strum. This is not the brewery in Ontario, California, but the vintage guitar shop and wine/beer bar on SE Stark Str. 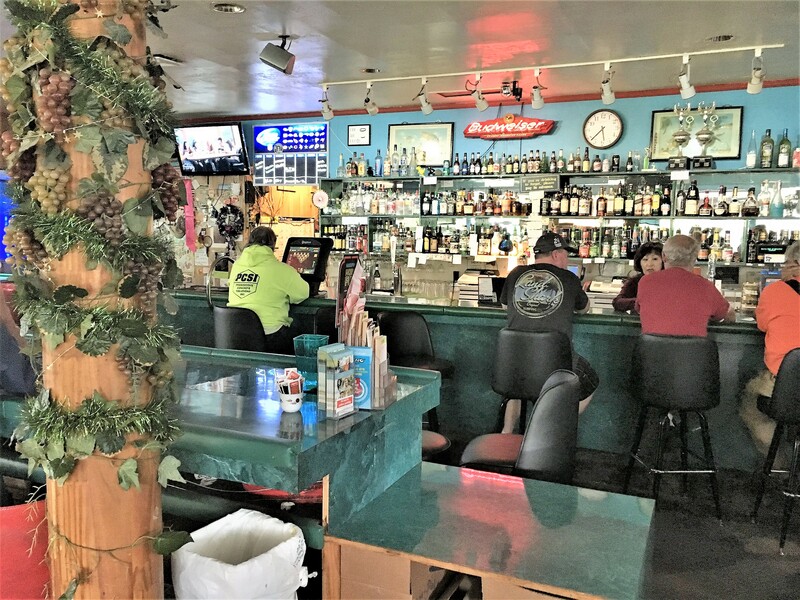 Now these niche-type establishments have a place and deserve support, but Thebeerchaser harkens back to the neighborhood pub or dive bar for true ambiance. 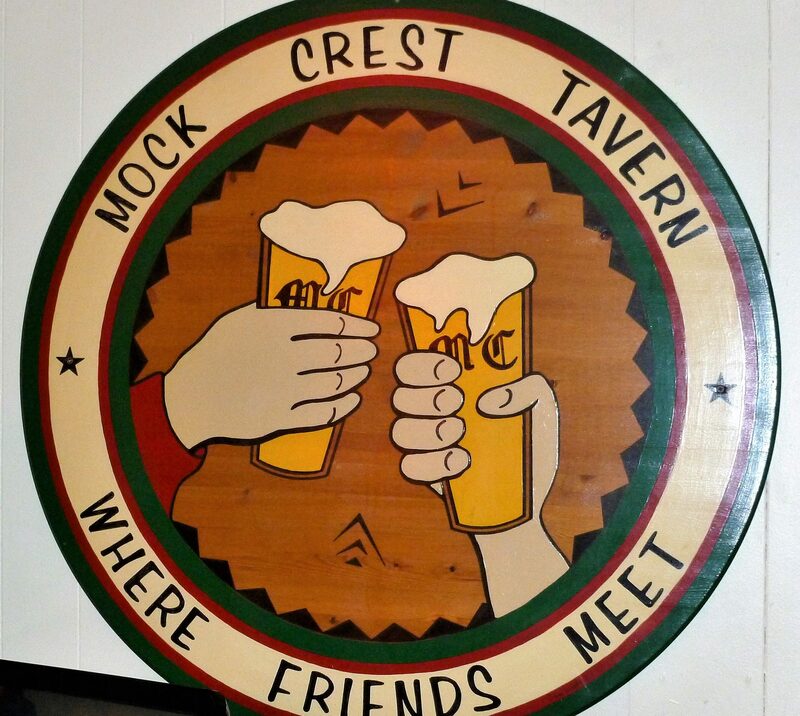 (Recent Beerchaser examples include The Standard, Mock Crest Tavern, or T.C. O’Leary’s or Gil’s Speakeasy just to name a few in Portland. “…beer geeks (are) wondering if the craft bubble has finally burst…..The answer might be to freshen up your direct-to-consumer roots, like all the local beer bars that have recently remodeled…..
One of such establishments that has done it right is Old Town Brewing – in its brewery and pub on NE Martin Luther King Blvd. Old Town Brewing in N.E. 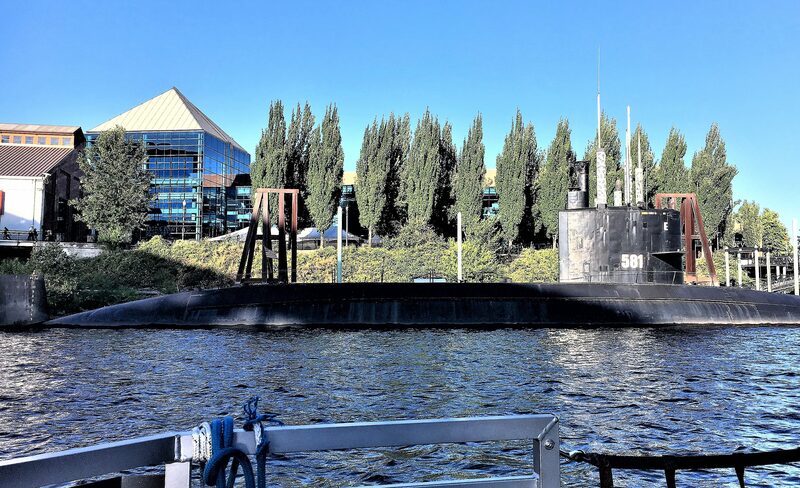 Portland – sparkling, but feels like home.. Stay tuned for the review…. 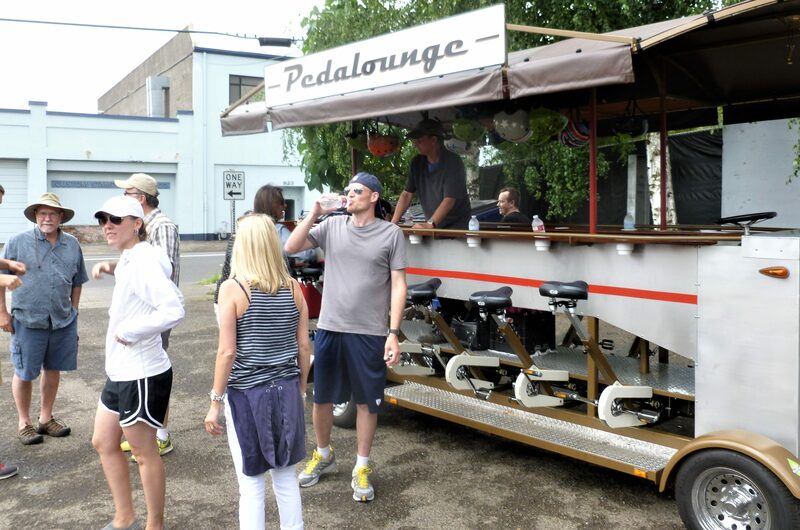 Thebeerchaser’s first experience on a mobile bar (as contrasted to the similar sensation in college described as the “Blind Whirley’s”…) was in 2014 on the Portland Pedalounge. Lloyd, the owner and “driver” took us on a great trip through the streets of SE Portland, stopping for brewskis at several bars and breweries along the way. My friends and I really enjoyed this trip – and Lloyd was a kick. All of us would recommend it. 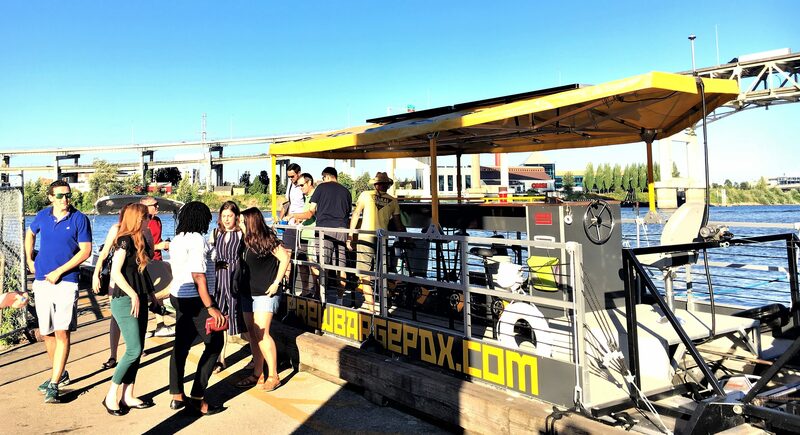 The second “bar in motion” experience was last week on the Portland BrewBarge. 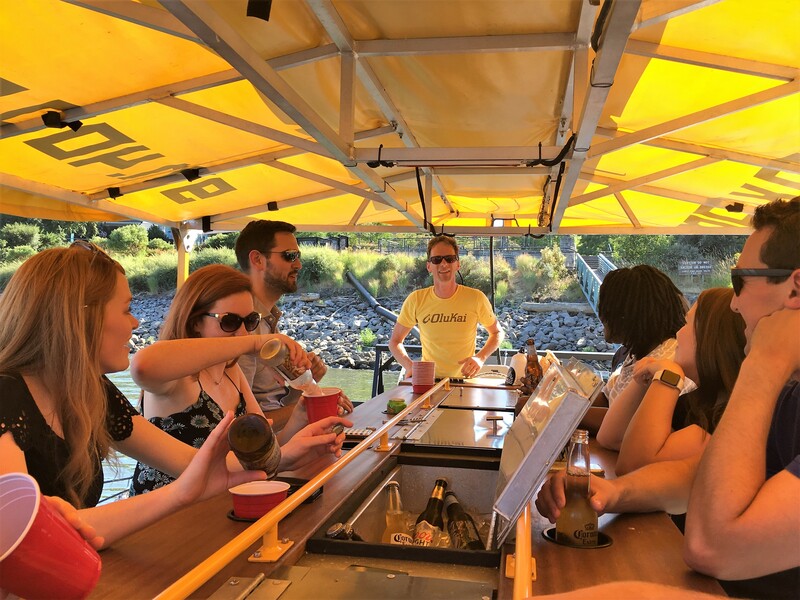 Unlike the Pedalounge or this company’s equivalent BrewCycle where you drink at stops along the way, you can enjoy a beer while “pedaling” the boat or just relaxing on your leisurely 90-minute cruise up and then back down the Willamette River – either with your own beer or what you purchase from them. 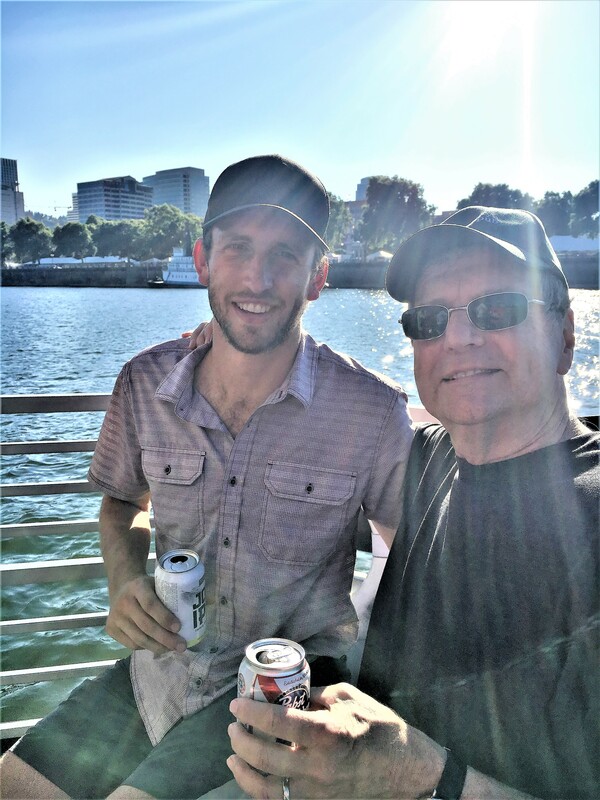 My son-in-law, Ryan Keene and I joined two of my favorite lawyers – Brien Flanagan and Carson Bowler – Environmental Law partners at Schwabe Williamson & Wyatt, where I worked for twenty-five years before retiring. 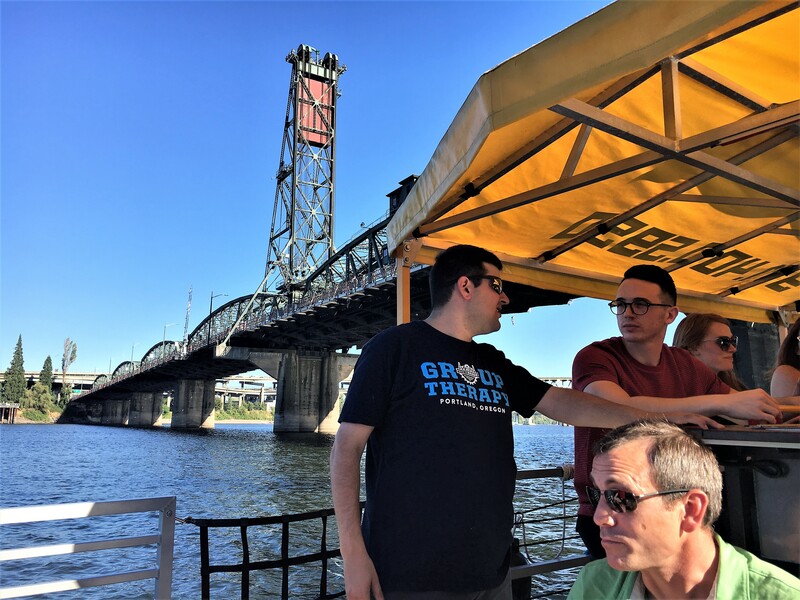 The BrewBarge was an outing for Summer Associates (law school students who clerk at the firm) and a few graduates who had finished the Oregon Bar Exam that afternoon and were understandably ready to slake their thirst. Captain Eric in yellow shirt) brief his crew..
Captain Eric, a Wilson High School alum, and Eric Johnson, who was the deckhand, after advising us on safety procedures (given the number of lawyers on board, I assume this was more extensive than their standard spiel.) 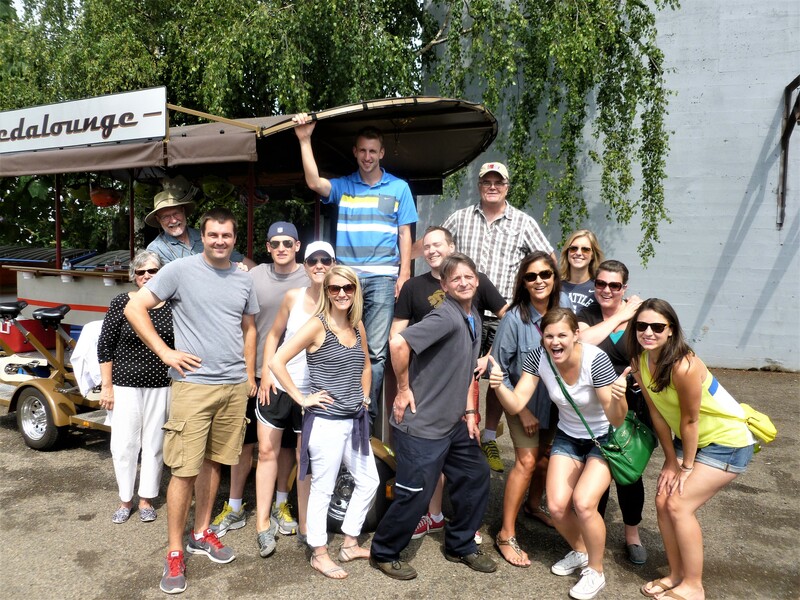 headed north and the young guys and gals peddled while downing beer which was mostly bottled IPA’s. I sat on the far aft bench with my two friends and downed two canned PBRs – it doesn’t get any better, especially since Brien – who got his law degree at prestigious Georgetown Law after graduating from Notre Dame – reminded me in light of Oregon State’s recent ignominious football record, how the Beavs cleaned the Irish’s clock 41 to 9 in the 2001 Fiesta Bowl. Captain Eric had worked there since the inception three years ago and business has been good for the owners who started the Portland venture after a successful run of the concept in Savannah Georgia. It’s quite reasonable and the cost is only $35 per person unless you take the 90-minute sail on Friday or Saturday when its $40. 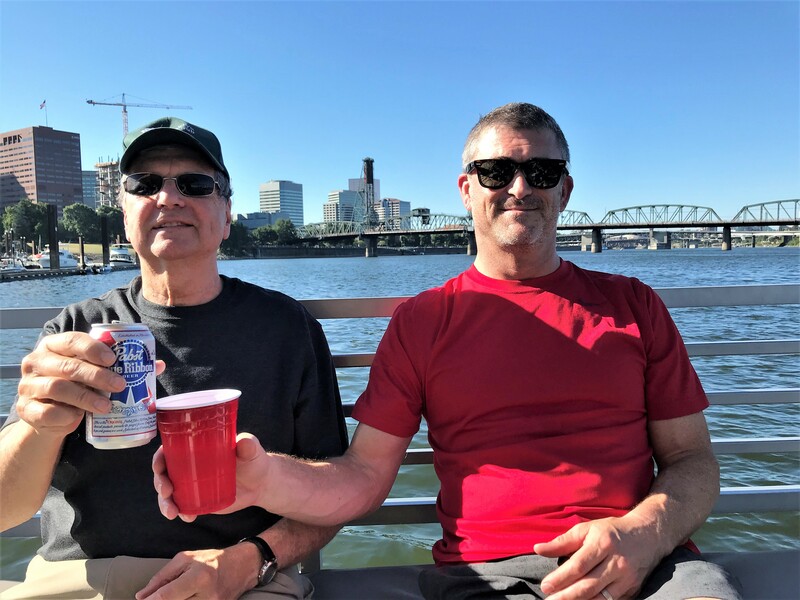 Bring your own beer to save on expense and enjoy the great views of the Willamette. 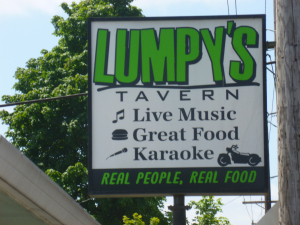 Speaking of local watering holes that feel like home (NOT!) my usually trusted resource Willamette Week hit it wrong on a recent recommendation. Well perhaps that’s true and to be fair, we only made one, rather than the customary two or more visits, but I will not return. 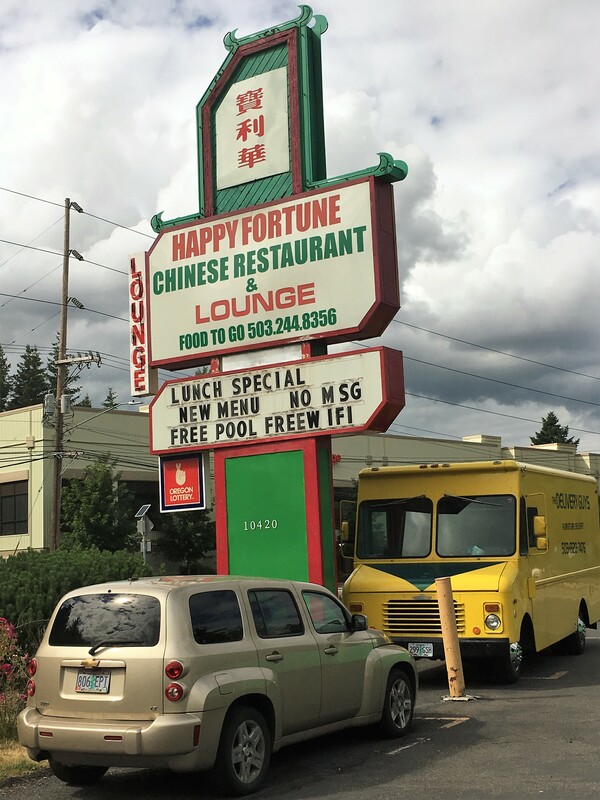 The selection of beers was not great, (I had a bottled Tsingtao) but the weekday afternoon, we were there, had no ambiance – either in the environment, staff or regulars and just did not hit the mark in my opinion. 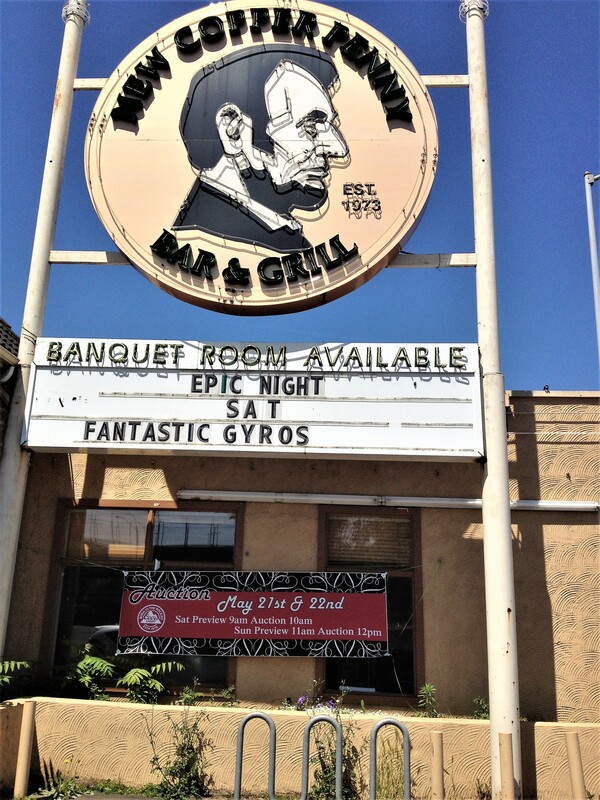 It seemed like an old and worn restaurant turned bar. My fortune that day was not a happy one!